This review by Robert Loerzel originally appeared in Pioneer Press on February 2, 2006. Pay close attention to the faces if you see “Bus Stop” at Writers’ Theatre — and not just the faces of the actors speaking at any particular moment. Look at the actors sitting at the other tables or standing behind the counter in the small-town Kansas diner where William Inge’s classic play is set. Even when director Rick Snyder’s cast members are outside the main action, you never get the feeling these are actors simply biding their time until the script calls for them to speak again. You can see the smallest flickers of thought in their eyes and mouths. Indeed, it’s the interaction among these actors that makes this production of “Bus Stop” so enjoyable. Inge’s play is a little dated in some places, but these actors make it all feel very believable. Four passengers and a bus driver are stranded overnight at Grace’s Diner while a snowstorm rages outside. Suzanne Lang plays Cherie (who was played by Marilyn Monroe in the film version of “Bus Stop”), an attractive dancer in a tawdry outfit She has a promiscuous past — an obvious fact not realized by the naive and bullheaded cowboy, Bo (Cliff Chamberlain), who has fallen in love with her. Bo’s tempestuous behavior, verging on violence, is frightening Cherie, so she’s having second thoughts about going to Montana to marry him. Lang persuasively conveys the confused mix of emotions swirling around inside Cherie, who seems like the stereotypical dumb blonde but isn’t as dumb as she first appears. She’s certainly not as dunb as Bo, who is almost too much of a clod to be believed Real-life experience verifies the actual existence of clueless dolts much like Bo, but he’s little more than a cartoon in Inge’s script — and his growth into a more mature man by the end of the play is unusually swift. Chamberlain, however, has a lot of fun in the role. His intense stare and rigid posture make Bo seem almost real. The cast is filled with other memorable performances. William Brown (so recognizable as the Goodman’s perennial Scrooge) is both pathetic and sympathetic as a Humbert Humbert-like professor with a penchant for liquor, young girls and quoting Shakespeare. As the waitress who watches all of the proceedings with a slightly amazed expression, Linsey Page Morton feels like the heart of the play. She’s surrounded by characters who seem very authentic: Mick. 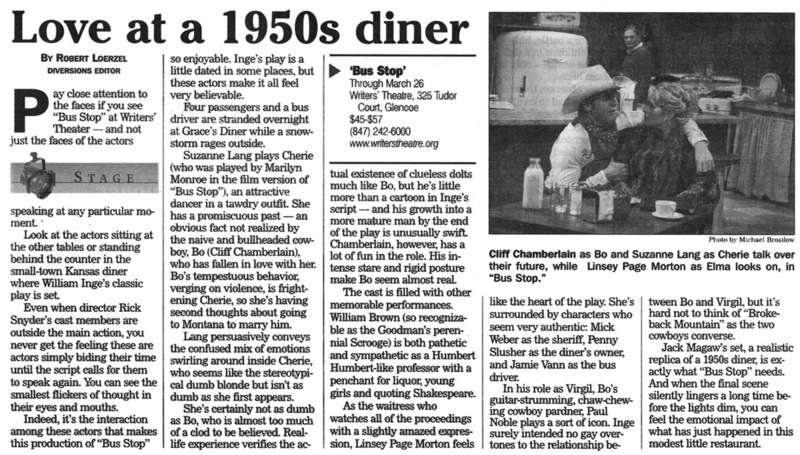 Weber as the sheriff, Penny Slusher as the diner’s owner, and Jamie Vann as the bus driver. In his role as Virgil, Bo’s guitar-strumming, chaw-chewing cowboy pardner, Paul Noble plays a sort of icon. Inge surely intended no gay overtones to the relationship between Bo and Virgil, but it’s hard not to think of “Brokeback Mountain” as the two cowboys converse. Jack Magaw’s set, a realistic replica of a 1950s diner, is exactly what “Bus Stop” needs. And when the final scene silently lingers a long time before the lights dim, you can feel the emotional impact of what has just happened in this modest little restaurant.